It’s been a while since I blogged, mainly because I’m crazy-busy at work. Unfortunately it’s all about things one can not automate using PowerShell: SP3 installation (OK, I can automate installation itself, but with pre-boot I can’t use it against laptops after business hours and I think it is not best idea to do it in background when people are working on their PCs), convincing users to use tools rather than phone when they have problems, inform users about recent changes in environment, and so long, and so fourth. But there were bright points that I would like to share. 1. I was asked to check our NetWare server for long paths. Some tool came together with that. If you guess I have not touched that tool you guessed wrong. 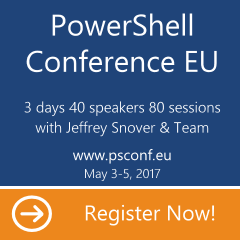 🙂 But sure – I first used PowerShell for that, tool was used only to confirm what I already knew. It has saved a lot of my time today (…) I’ve modified the script a little and we’ll use it for the remaining sites. Much easier. 3. After this e-mail I asked my boss if he thinks it’s a good idea to prepare internal PowerShell training for our regional team, got very positive feedback, so my class is almost ready. Plan to do the training in December, will se how it goes. 🙂 Next step will be either perform training for larger group (not in number, but in scope) or prepare deep dive course with more advanced topics covered. This function is trying to unlock AD users in three sites: UXB, BER and WAR. It’s connecting to a given service (Connect-QADService) and look for locked account(s). Parameter to limit query/ unlock to single user. Write-Host -ForegroundColor Cyan "Unlocked accounts:"
Write-Host -ForegroundColor Cyan "No locked accounts found!"